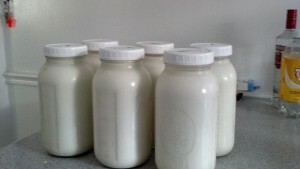 Raw-Milk | Would John Eat It? Raw Milk, and all products created through its use. So after contacting a bunch of farms and the New York State Department of Agriculture for the official list, I have finally finished a Python script that generates the appropriate KML for a Google Map of all addresses from a csv file. If you have a list of addresses and would like to generate a google map from it, please contact me and I will share my source code with you! This entry was posted in Raw-Milk on December 6, 2012 by John. 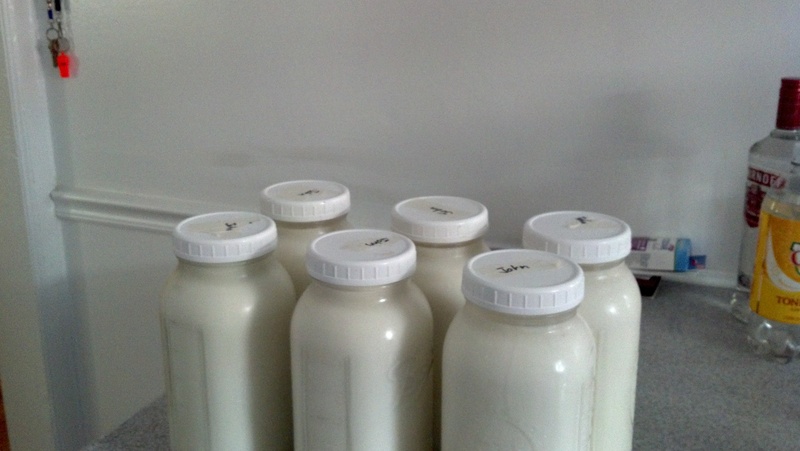 Last time I visited Edgwick Farm I purchased 2 gallons of raw Goat’s milk, which went rather quickly, so this time I decided to scale up a bit so I ordered 3 gallons. I left my house at 8:22. Farmer Dan was going to leave the farm at 10 am in order to go to a farmers market. My GPS said it would take 1 hour and 30 minutes to get there… luckily traffic was on my side that morning, and I made it there by 9:30. Farmer Dan had the 6 jars of milk ready for me with a label “John” on each of them. I loaded up my cooler and headed to a nearby store for some ice. Back home, I left 3 of the jars outside of the refrigerator in order to get them to room temperature for the creation of yogurt. In the meantime, my younger brother had arrived with one of his friends. Only my brother had the guts to try the raw milk… Then they both noticed how I left the jars outside of the refrigerator and I told them that I was going to turn them into yogurt. I waited for about 2 hours and then placed the 3 jars (half a gallon each) into a large pot. I turned on the burner and took a large 17oz container of Fage Total Classic (read: with all the fat) and set it outside to let it warm up slowly to room temperature. So while I was waiting for the milk to heat, I said to myself, let’s try this original brand of Greek-Yogurt. I must say… Fage does make some pretty good yogurt! I also want to say that that paper net/remnant from their straining process is pretty cool as well. I love peeling it off with my fingers and licking the yogurt remaining yogurt from it. Anyway, so 110 degrees Fahrenheit is reached, and I place 17ounces of Fage Total minus a few tablespoons which I ate into the mixture and stir thoroughly. I place it into a warm oven, which has the heat turned off but was just preheated to 200 degrees. This time I decided to place a thermometer into the pot while it was incubating. Now my thermometer was not big enough to touch the bottom of the pot, and neither did it have a latch to hook on to the side of the pot to prevent it from falling in. So I decided to take a thin towel and to cover the pot with it and to leave a little opening to the side for the thermometer to latch on to. This way I kept checking the temperature of the incubating cultured milk every 2 hours and I would turn the oven on for a few minutes each time to let the mixture slowly increase its temperature back up to 110. So 7 hours passed, and I looked at the mixture and did not see any whey separate onto the top, remember, this is raw goats’ milk yogurt, which means that the yogurt cultures are competing with other present cultures (i.e. beneficial stuff not present in pasteurized milk) so I decided to press on and let the milk culture overnight. So I set the alarm for 3am and when it went off I took a look at the temperature and heated the oven for a little bit. The yogurt produced a little more than half a gallon of whey after straining it, and a really large bowl and just a large bowl of strained greek-yogurt. Warning: Do not eat raw goat’s milk yogurt, it will ruin your taste buds and you will be forever unable to eat yogurt from any retail location and/or restaurant ever again in your life. Also, I want to say that according to mainstream medicine, I am “lactose intolerant”, which means if I drink milk from a regular dairy – such as Tuscan Farms or any other conventional brand of milk, my stomach will immediately become upset and I will have lots of flatulence and will make many trips to the bathroom. When drinking this milk, I do not have even the slightest sympton of “lactose intolerance”. Are any professors listening? 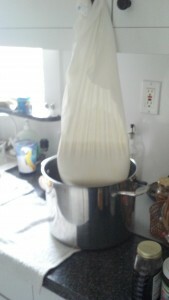 This entry was posted in Raw-Milk on August 6, 2012 by John.